Habit: Annual 6--30 cm, aromatic. Stem: erect, simple to branched at base, short-hairy, minutely glandular distally, hairs spreading to reflexed, glands dark. Leaf: 8--70 mm; blade > petiole, narrowly oblong, deeply lobed to compound, lobes entire, leaflets +- lobed. Inflorescence: exceeding leaves, open proximally; pedicels < 10 mm in fruit, straight. Flower: calyx lobes 4--5 mm, 6--10 mm in fruit, oblanceolate, short-stiff-hairy, minutely glandular; corolla 3--5 mm, bell-shaped, tube yellow, lobes white to lavender, scales 0 or free from filaments, linear; stamens 2--3 mm, glabrous; style 1--2 mm, cleft < 1/4, generally glabrous. Fruit: 4--6 mm, oblong to ellipsoid, puberulent proximally, sparsely short-glandular-hairy distally. Seed: 15--30, +- 1 mm; cross-furrows 5--8. Chromosomes: n=11,12. Ecology: Open, sandy or gravelly areas; Elevation: 500--3400 m. Bioregional Distribution: s SCoRI (Caliente Mtn), TR, PR, W&I, D; Distribution Outside California: to Utah, New Mexico, Sonora, Baja California. Flowering Time: Mar--Jun Note: Esp abundant after fire. 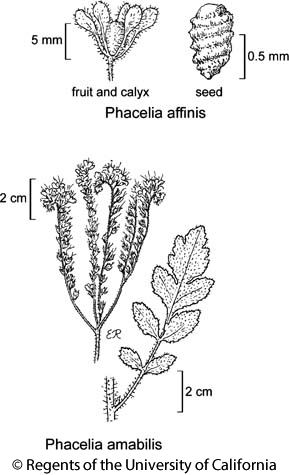 If recognized taxonomically, plants with spreading stem hairs, glandular proximal leaves assignable to Phacelia affinis var. patens J.T. Howell. Citation for this treatment: Genevieve K. Walden, Robert Patterson, Laura M. Garrison & Debra R. Hansen 2013, Phacelia affinis, in Jepson Flora Project (eds.) Jepson eFlora, Revision 1, http://ucjeps.berkeley.edu/eflora/eflora_display.php?tid=37404, accessed on April 19, 2019.
s SCoRI (Caliente Mtn), TR, PR, W&I, D; Markers link to CCH specimen records. Yellow markers indicate records that may provide evidence for eFlora range revision or may have georeferencing or identification issues. Purple markers indicate specimens collected from a garden, greenhouse, or other non-wild location.